It’s not that Andre Iguodala can’t shoot; he’s just not a great shooter. Upstart Philadelphia learned that the hard way in a 110-90 loss to the Warriors, as Iguodala poured in six first-half three-pointers en route to 32 points. While that unexpected barrage from long-range was certainly impressive, it’s fitting that Iguodala’s night will be just as memorable for two other plays: a 60-foot alley-oop from Steph Curry and a mid-air, behind-the-back pass to David Lee. Not a bad homecoming for the former 76er to say the least. The Warriors don’t count on Iguodala for points, of course. Curry, Lee, and Klay Thompson provide enough consistent scoring output for Golden State that he can focus on the proverbial ‘little things’ at which he really thrives: passing, defending, and filling gaps on both ends of the floor. That’s a shift in responsibility definitely welcome for Iguodala, who was taxed beyond his comforts as a primary offensive option in both Philadelphia and Denver. But none of that means he’s incapable of putting up big numbers should the opposition give him ample and open opportunities to score. That was the 76ers strategy from the opening tip last night, and it’s one Iguodala and the Warriors will face frequently as the season progresses. Sharing the floor with elite marksmen like Curry and Thompson is a luxury for a playmaker of his talents, but it could potentially frustrate if Iguodala is unwilling to take open shots, too. That indecisive compliance was evident on several occasions in Golden State’s first three games of the season; just over six shots per game simply isn’t enough for Iguodala, even if nearly half of them came from beyond the arc. That passivity was absent on Monday, and Iguodala reaped the benefits. Philadelphia made a consistent and concerted effort to dare him to shoot, ignoring normal rotations and shading to the Splash Brothers when he caught the ball far from the basket. 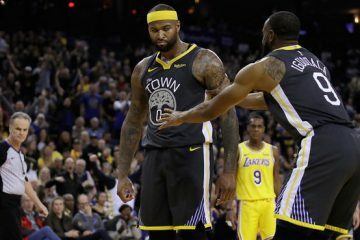 An open three-point or long-two try from Iguodala is a far better proposition than one from Curry or Thompson, the thinking goes, and that’s sound logic. He’s a career 33.1% shooter from beyond the arc and made a dismal 31.3% of two-point shots taken from outside the paint last season in Denver. But context is crucial; all jump-shots aren’t created equal. Most all shooters are more comfortable off the catch than the dribble, and that’s especially true of middling ones like Iguodala. 19.8% of his three-pointers with the Nuggets were unassisted; that’s not a huge number for a legitimate first option, but too big for an ancillary offensive piece whose strengths lie outside the simple realm of shooting. Iguodala was forced to take ‘bad’ shots due to the surrounding roster’s construction at his previous two NBA stops, but that’s not the case in Golden State. Of the 10 three-pointers Iguodala has made this season, all have been assisted. A similarly dramatic shift can be seen with regard to two-pointers: Iguodala’s had help on nearly 20% more of his baskets inside the arc as a Warrior than he did as a Nugget. The sample size is small, obviously, but the narrative supports these early results. On the left is Iguodala’s second three-point attempt with Denver, taken off-the-dribble with the shot-clock winding down. At right is one from last night. This comparison is far too simple to glean concrete and longterm analysis, but the broad takeaway is here regardless: the vast majority of Iguodala’s three-point attempts for Golden State look more like the latter than the former. The benefit of such a deviation for a shooter of his caliber can’t be understated. 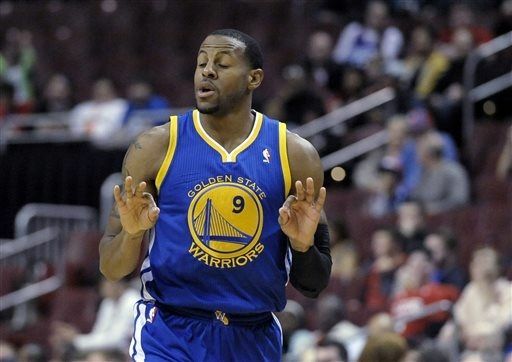 The Sixers dared Iguodala to beat them last night and he was up to the challenge. Nine seasons worth of data indicates that was a sound strategy, but Philly and Denver to Golden State is hardly apples to apples. 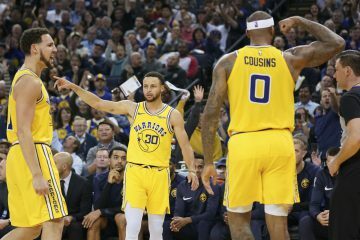 The constant neighboring threat of Curry and Thompson is something Iguodala’s never enjoyed before, and his wealth of talents will be magnified for it – perhaps as a shooter as much as anything else. 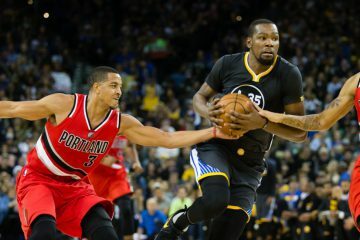 Statistical support for this post provided by nba.com/stats. Jack Winter is a 24 year-old Bay Area import. Having grown up in Kansas City without an NBA team to root for, his Warriors fandom is complicated. He loves help defense, extra passes, and the additional efficiency of corner three-pointers. After recently relocating from San Francisco to Oakland, he's an avid and tireless defender of the East Bay. 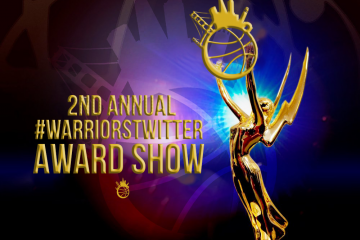 He contributes to ESPN TrueHoop sites Hardwood Paroxysm, Magic Basketball, and HoopChalk, and encourages you to reach him via Twitter (@armstrongwinter) or e-mail ([email protected]). When he hikes his FT %age to at least 80%, sure why not? Good read … he’ll definitely have more games like this! @ Slap Dog I disagree, Iggy is perfectly capable at hitting uncontested 3’s and he should get a lot of them with Curry and Clay at his side. Defenses will not be able to double team any of them or this will happen. And if they decide to play the shooters tight then Bogut and Lee will be able to go off inside. I( doubt we will see many more games like that one from Igoudala. those will be too far and between. Good catch, Tony. Accidentally looked at his +/- as opposed to points scored. Thanks! Iguodala actually didn’t score 35 points, he scored 32 and came out after the 3rd quarter. If we weren’t killing them so badly though, he would have easily had a new career high.